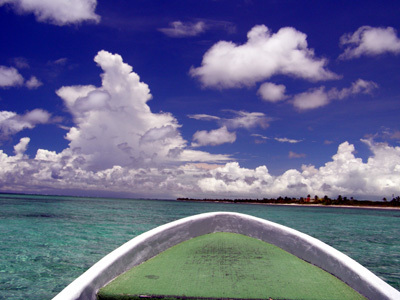 Remote and way off the beaten path - Costa de Cocos lies on the border between Mexico and Belize. 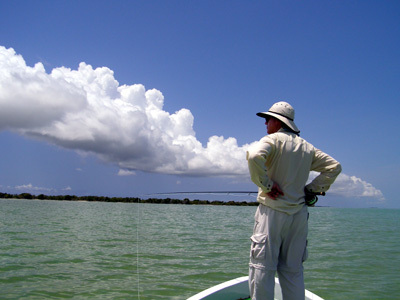 Overlooked and under-fished, Mexico's southern Yucatan is an angling frontier just waiting to be explored. 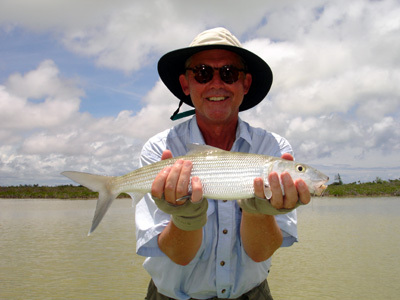 Swaying palms, comfortable thatched roof cabanas and delicious food round out a great un-pressured angling destination. 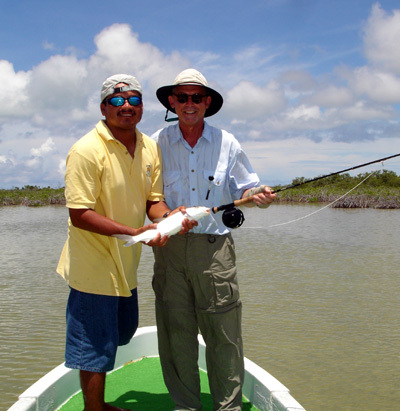 We had an enjoyable week here at Costa De Cocos Lodge. I was joined by Rod Squires, Dr. Tom Lundeen, Bob Bond, and Rufus Williams. 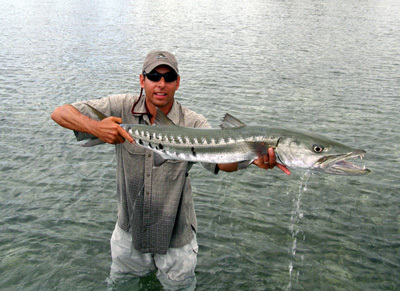 The bonefishing here surprised me, both in numbers of fish and size. 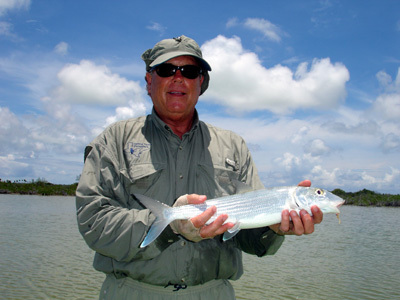 Lots of bonefish in very skinny water made this trip ideal for those new to flats fishing. 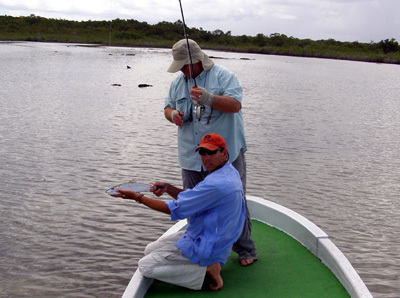 We found many taling bones that readily ate our flies, and the wade fishing here is excellent. 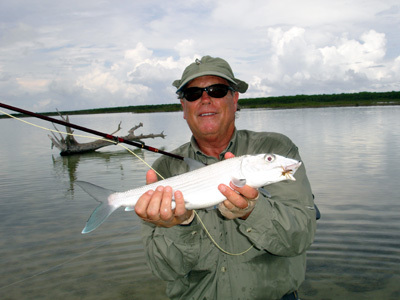 There is also great after hours angling right at the lodge, and I caught bones and a permit within walking distance of our cabanas in the evening after a day with the guides. 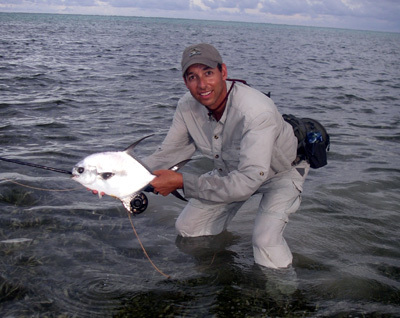 There are also lots of permit around, and two were landed at the lodge during our stay. 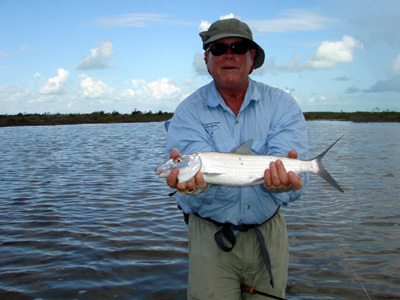 Baby tarpon can also be found, as well as many large barracuda, snook, jacks & snappers. 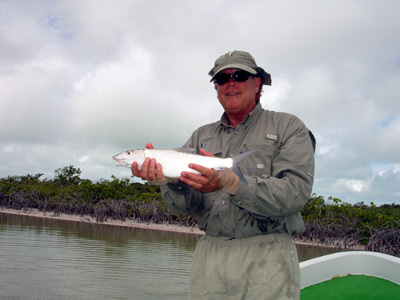 This is a great place to try for a grand slam--a permit, tarpon and bonefish all in the same day. 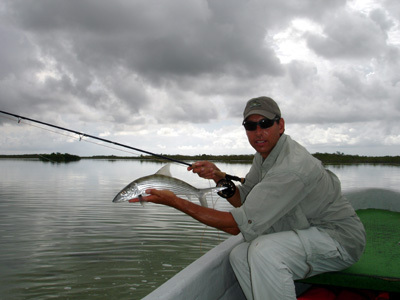 I came close one day, and caught a tarpon and bonefish by 10am, and we searched for the permit, and I had numerous shots, even getting a permit to eat my fly, but none were brought to the boat that day. 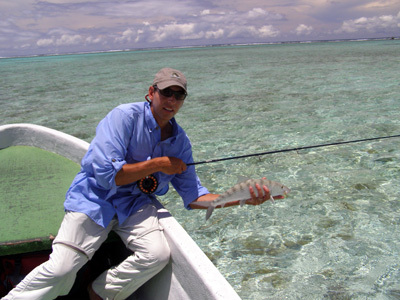 I did get a permit the evening before fishing on my own in front of the lodge, and some of the guests tried to convince me that I got the grand slam because all three had been caught within 24 hours (thanks for your sympathy!) --but I declined--all three must be caught within the same fishing day, in my opinion. 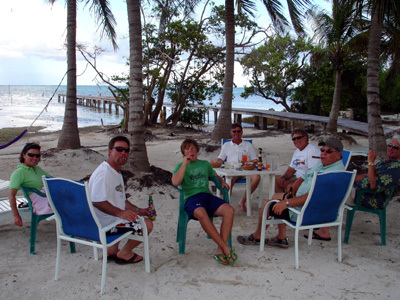 We stayed in individual cabanas constructed of native stone and hardwoods. These spacious rooms have two double beds and a private bath with hot shower. There are also single cabanas available. Three meals per day are included in your package, as are all beverages, including alcohloic ones. Breakfast is generally light, but special requests for hardier appetites will be accommodated. 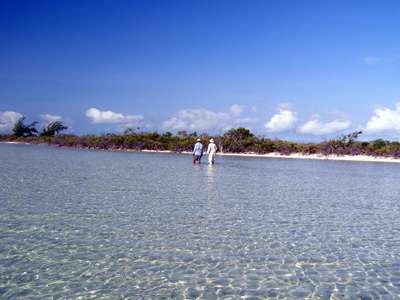 Lunch is almost always on the flats. Gourmet dinners were wonderful, and you can order anything off of the menu. The fresh lobster was great, and I think Dr. Lundeen ordered it every night! 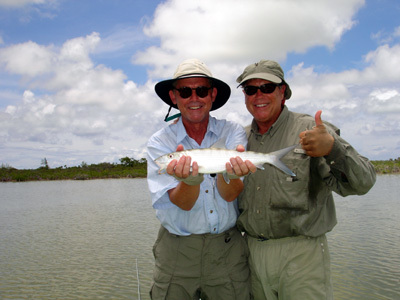 The menu includes a full range of seafood, local fare, and more traditional foods. The appetizers were fantastic--chile rellenos, calamari, california rolls w/lobster, fresh tortilla chips and pico de gallo, and all the beer and margaritas you desire. 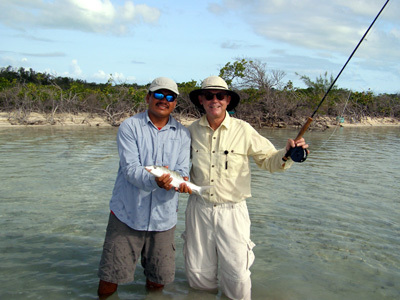 Costa de Cocos is a great place to go to in Mexico for those seeking variety in species of fish to catch. 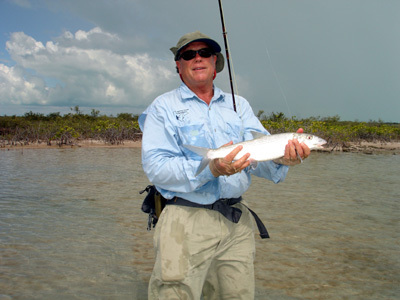 This is a great place to try for the grand slam, as there are lots of permit and you can expect many shots per day if you're looking for them. 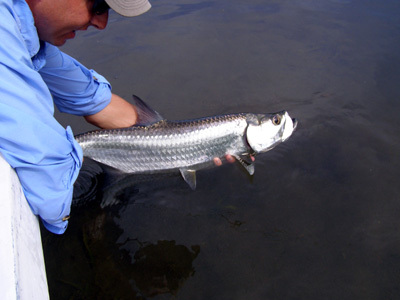 There are tarpon very close to the lodge, and bones galore. 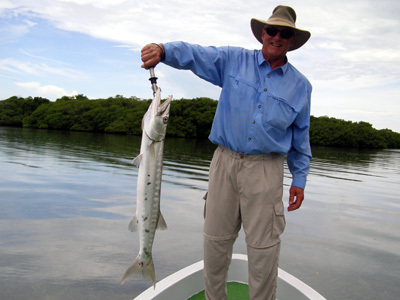 Barracudas, jacks and snappers are also abundant, as are snook certain times of the year. 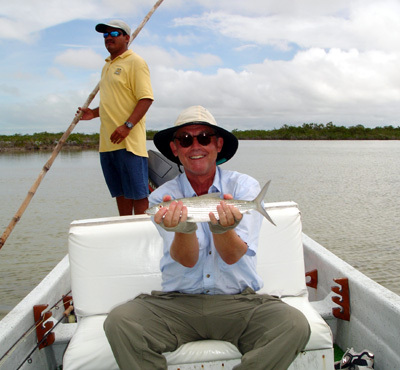 The food is wonderful and lodging very comfortable, and the owners David and Illana are excellent hosts.